The 6th Call for Short Term Scientific Missions (STSMs) under COST Action FP1203: European NWFPs Network is open. We invite STSM candidates to submit their applications. Deadline for applications has been extended until the 26th of February 2016. The STSM proposals on this call should not start before the 15th of March 2016 nor end after the 15th of May 2016. Short Term Scientific Missions (STSM) are aimed at supporting individual mobility, strengthening existing networks and fostering collaborations by allowing scientists to visit an institution or laboratory in another Participating COST Country or an approved COST Near Neighbouring Country institution or an approved COST International Partner Countries institution. A STSM should specifically contribute to the scientific objectives of the COST Action, while at the same time allowing applicants to learn new techniques or gain access to specific instruments and/or methods not available in their own institutions. Early Stage Researcher (ESR) are especially encouraged to submit STSM applications. For application details including financial Support, applicant and host institution, duration and application process please read the full text: 6th Call for Short Term Scientific Missions. COST FP1203 STSM Coordinator, Dr Tine Grebenc can be contacted using the form at www.nwfps.eu/stsms. A Call for the Training School on “Marketing of Wild Forest Products: theory and practice” under COST Action FP1203: European NWFPs Network is open. This Training School is going to be held in San Vito di Cadore (Belluno – Italy): 14th -18th March 2016. We invite Trainees candidates to submit their applications until the 19th of February 2016 at http://goo.gl/forms/5kFWDjsiuX. Training Schools are an important part of COST Actions and are intended to share knowledge and support collaboration. Within the scope of COST Action FP-1203 a Training School offering a general overview on methodological aspects related with non-wood forest product marketing has been prepared by Task Force 4 (Marketing). Topics to be covered include the business context analysis: (relationship product/market; property rights/ regulative framework), strategic marketing (segmentation - targeting), differentiation, positioning), operational marketing (marketing mix: 4+2 Ps, with special focus on pricing, logistic, branding, e-business, customer-supplier relationships). The course will combine theoretical lessons, case studies analysis and the presentation of some tools for marketing research: DBs (trade data, regulations, Codex Alimentarius, Google Analytics, …), value chain analysis, network analysis, social capital analysis. Discussions on real case studies presented to the participants will be also carried out. Early Stage Researchers (ESR, for more details http://www.cost.eu/service/glossary/ESR) are particularly encouraged to attend to this Training School. Attendance certificates will be issued to the participants. All teaching material will be available on the University of Padova Moodle platform. The platform will be shared among the participants and made available for future training programs. For application details including financial Support and application process please read the full text: Training School Call. 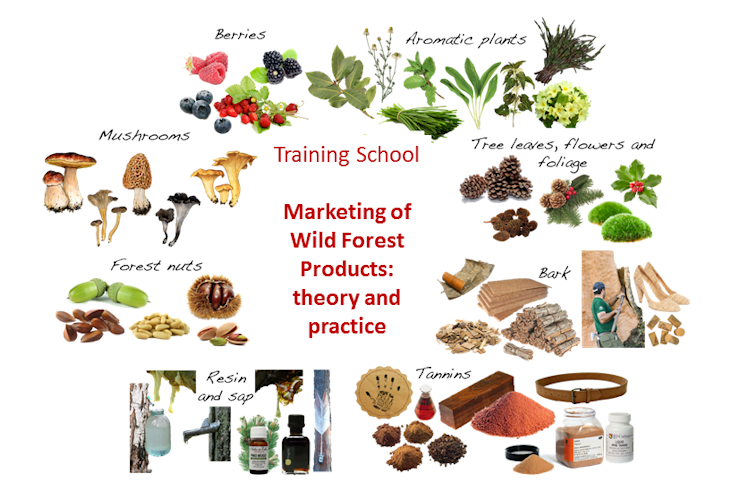 Training School “Marketing of Wild Forest Products: theory and practice” organiser, Professor Davide Pettenella can be contacted using the form available at Training School on “Marketing of Wild Forest Products: theory and practice”. "Climate-sensitive models for mushroom yields and diversity in Cistus ladanifer scrublands"
The corresponding STSM report is available together with the other STSM on NWFP in this website. We would like to say thanks to María Hernández Rodríguez for her efforts and work on NWFP in the framework of this COST Action. The 5th Call for Short Term Scientific Missions (STSMs) under COST Action FP1203: European NWFPs Network is open. We invite STSM candidates to submit their applications until the 1st of July 2015. The STSM proposals on this call should not start before the 15th of August 2015 or end after the 15th of May 2016. A STSM should specifically contribute to the scientific objectives of the COST Action, while at the same time allowing applicants to learn new techniques or gain access to specific instruments and/or methods not available in their own institutions. Early Career Investigators (ECI) are especially encouraged to submit STSM applications. For application details including financial Support, applicant and host institution, duration and application process please read the full text: 5th Call for Short Term Scientific Missions. COST FP1203 STSM Coordinator, Dr Tine Grebenc can be contacted using the form at www.nwfps.eu/stsms. The 4th Call for Short Term Scientific Missions (STSMs) under COST Action FP1203: European NWFPs Network is open. We invite STSM candidates to submit their applications until the 23rd of February 2015. The STSM proposals on this call should not start before the 23rd of March 2015 or end after the 31th of May 2015. A STSM should specifically contribute to the scientific objectives of the COST Action, while at the same time allowing applicants to learn new techniques or gain access to specific instruments and/or methods not available in their own institutions. Early Stage Researchers are especially encouraged to submit STSM applications. For application details including financial Support, applicant and host institution, duration and application process please read the full text: 4th Call for Short Term Scientific Missions. COST FP1203 STSM Coordinator, Dr Tine Grebenc can be contacted using the form at www.nwfps.eu/stsms. The 3rd call for Short Term Scientific Missions (STSMs) under COST Action FP1203: European NWFPs Network is open. We invite STSM candidates to submit their applications until the 26th of September 2014. The STSM proposals on this call should not start before the 25th of October 2014 or end after the 15th of May 2015. For application details including financial Support, applicant and host institution, duration and application process please read the full text: 3rd Call for Short Term Scientific Missions. COST FP1203 STSM Coordinator, Dr Tine Grebenc can be contacted using the form at www.nwfps.eu/stsms. Register for the StarTree final conference now!